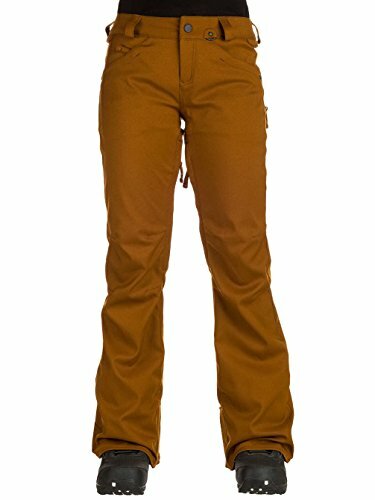 Volcom Snow Women's Species Stretch Pants Copper Medium | What Should I Say? Carve the slopes in comfort and style this season. Fully taped seams. Stretchy, slim fit pants with a modern cut that hugs the body while still leaving room for movement. Volcom Zip Tech® system keeps the snow out by letting you zip your jacket to your pants. V-Science Boot Gusset features a stretch gaiter with a clip to help keep snow out of your boots. Belt loop waistband. Adjustable inner waistband. Zip fly with button close. Triple reinforced rise. Specialty ticket ring. Brushed Tricot lined handwarmer pockets. Three pocket design in back. Mesh backed zip vents on inner thigh. Boot gaiter with lace hook. Heathered design. Branding on button and back right pocket. 100% polyester;Lining: 100% polyester. Machine wsh, tumble dry. Imported. Measurements: Waist Measurement: 30 in Outseam: 41 in Inseam: 32 in Front Rise: 9 1⁄2 in Back Rise: 14 in Leg Opening: 22 in Product measurements were taken using size SM (US 3-5). Please note that measurements may vary by size. Carve the slopes in comfort and style this season. Stretchy, slim fit pants with a modern cut that hugs the body while still leaving room for movement. Volcom Zip Tech® system keeps the snow out by letting you zip your jacket to your pants.